With the principles from The 7 habits of highly effective people, the author tells how to meet the goals of strong business leaders. Very good to have in tandem with "The 7 habits of highly effective people. "Provides tremendous insight on human nature. Provides a great foundation for Management and how to utilize your people effectively. 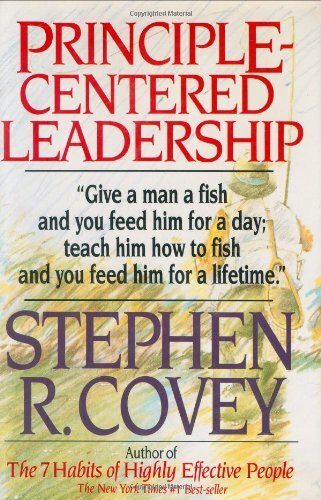 I highly recommend Stephen Covey's books. The theme of Principle-Centred Leadership is to become a leader by centering oneself on principles, values, and natural laws rather than on external centers such as family, money, possessions, enemies, work, etc. On this basis, Covey emphasizes that a man’s security comes from inside principles rather than from outside factors. Covey dives into the nature of human beings and capitalizes on its capabilities to transform the team and the organization. He stresses the necessity of achieving the Private Victory on the individual level to achieve the Public Victory, which is the concept around which his 7 Habits of Highly Effective People are built around. Stephen Covey considers mission statement the essential recipe for success in any leadership endeavor. He urges individuals and organizations to develop mission statements that will guide people and align systems and procedures to achieve its goals. PCL enforces tapping people’s potentials and creativity rather than using them only as resources and assets. Involving people in creating a mission statement is necessary to get buy-in, else, you’re running the risk of losing talented people to somewhere else. New York, N.Y. : Simon & Schuster, 1992, c1991.